When I was planning our wedding last year, one of the things that surprised me was the amount of money that some places were charging for flowers. I was quoted anything from €450-€1500 for various packages - now, I like flowers as much as the next person, but that, to me, is insanity. I had a look around online to see what I could come up with, discovered foam roses on eBay - and saved us a hell of a lot of money. I made bouquets and boutonnieres for the entire wedding party for next to nothing, using foam roses, crystal pins, artificial ferns, pins, ribbon, and stemtex (not an explosive) all sourced on eBay. 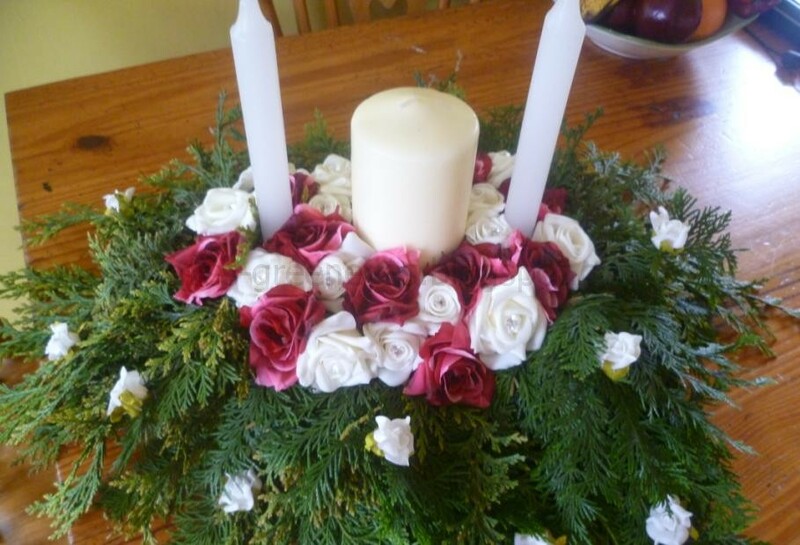 For the church decoration, I needed something pretty for the candles. 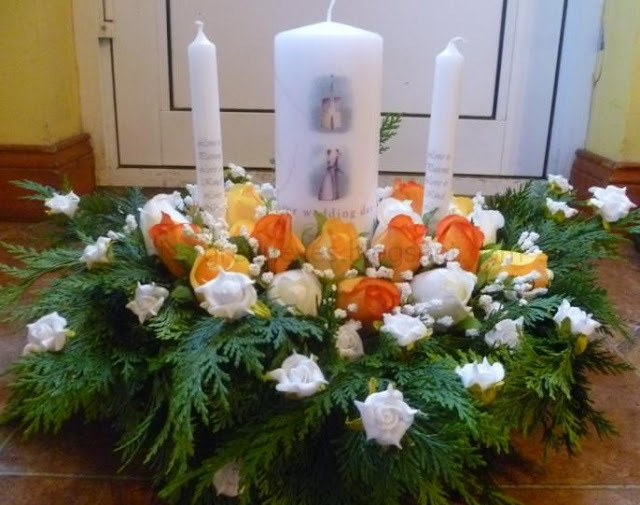 The first website I went to quoted me €85 for just the altar arrangement - never gonna happen. 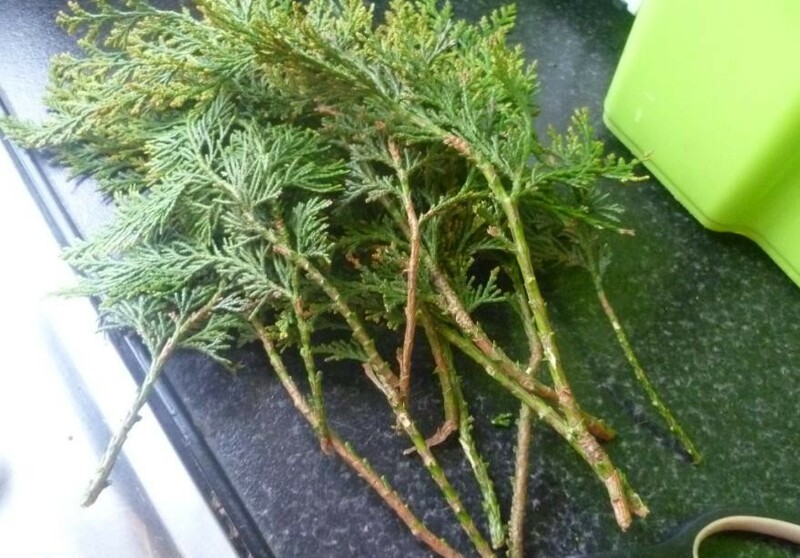 Here's a picture of ours - I didn't take any other pictures but I recently did another one for a friend and made sure to take step-by-step pictures to show you how easy and cost effective it is to do it yourself. I got a brick of oasis foam and the tray on eBay, but you can pick a single brick of oasis up in any florist for around €2-€3 and get a tray in any gardening supply shop (Homebase, Woodies, etc). 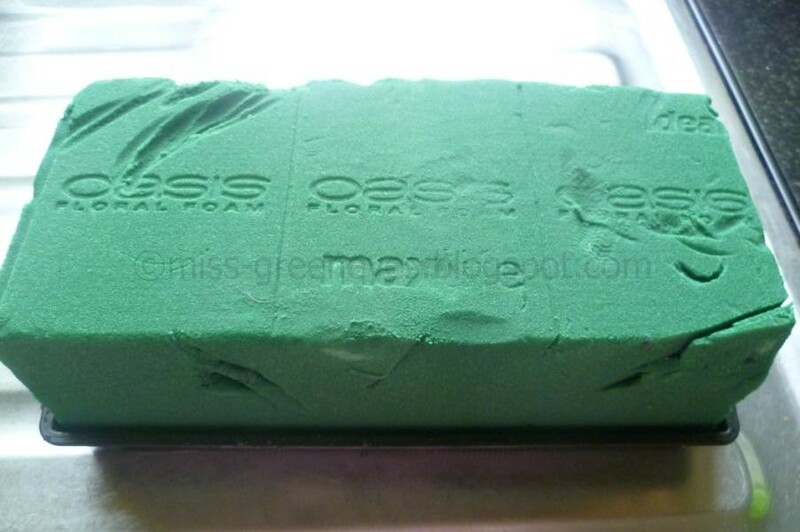 The Oasis was a bit battered after being shoved around in a box, but it'll all be covered anyway. Then, I got my candles, and placed them in the oasis brick. In this case, my friend had her own candles so I just used these as guidelines and she replaced them with her own afterwards. 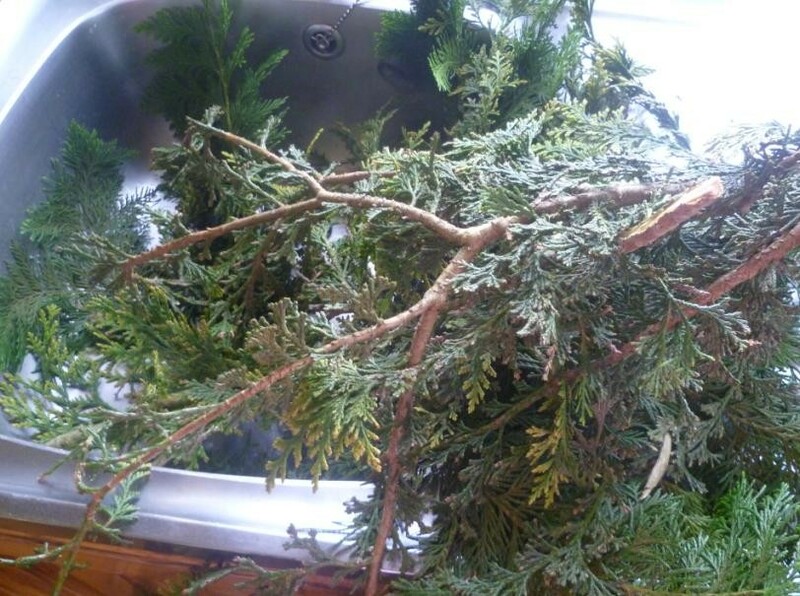 Next, I went outside and got a load of palm branches. Okay, I didn't. I got my husband to do it. But you get the idea. I cut off every little branch I could find - almost nothing was wasted except the big woody bits in the middle. 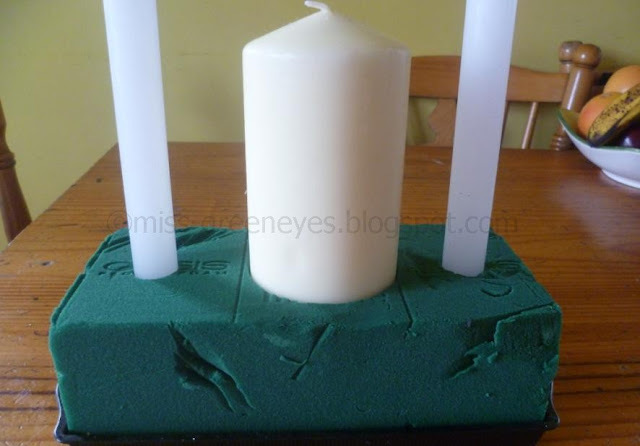 I stuck them into the oasis until the whole base was pretty much covered, leaving a bit of space around the candles. I used some mini wire roses to decorate the outer parts of the palm - I just wound them around the stems. Next, I got some foam roses (left over from making my bouquets), cut the stems down, and stuck them in around the candles. My friend had red bridesmaid dresses, so I bought a bouquet of artificial red roses on eBay and chopped the roses out of it. I pushed them down in between the white roses and candles. Finally, I pushed some crystal pins down into the middle of the large white roses. And it's done - it took a half hour maximum. The only hassle with this is the need to do it as close to the wedding day as possible, otherwise the palm can dry out pretty quickly. You can soak your oasis in water, but I made this one two days before the wedding and it was perfect. I think I did my own one on the Thursday, for our wedding on Saturday. You could add some fresh flowers in if you wanted to. 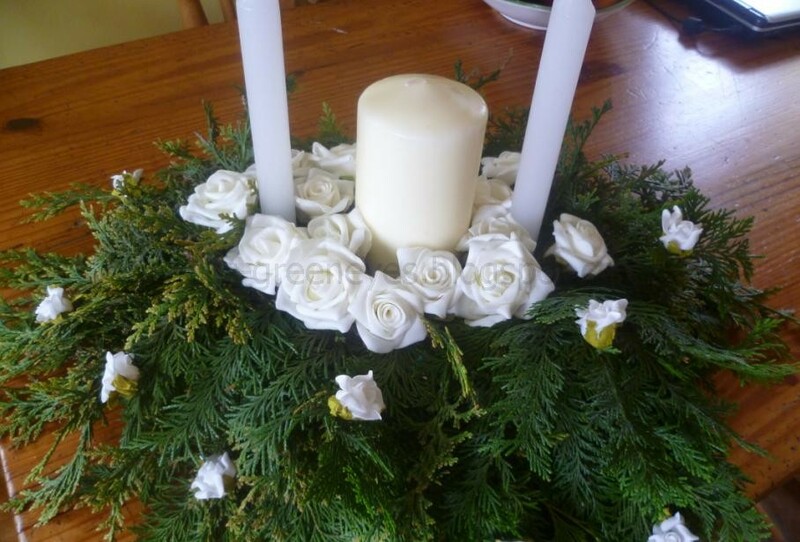 2 bunches of ivory foam roses (16 in total) - eBay: €9.50 highly recommended seller, I bought all the roses for my bouquets & arrangements from her, a lovely lady to deal with. Bit of a difference from €85, isn't it? Wow, that is beautiful! You couldnt tell the difference between that and one from the florists! Great stuff! this is awesome! My granny has started doing flowers and I couldnt believe when she told me how much florists mark up stuff. Did you do most of the wedding stuff yourself? What did you do for the reception i.e hotel or what sort of affair? We were supposed to get married this september but then when we discovered we were pregnant we postponed it until next year, date still to be set. I want to do it as cheaply as possible though to be honest; i've better things to spend money on! Oh, this is beautiful! Great job! I also think that DIY's are more rewarding too! Weddings are sooo expensive! My wife and I did all of our own decorations, invites etc ourselves because the prices the 'professionals' were asking was just ridiculous! Good Job! I still can't believe that some people would pay that kind of money, even invitations - the very lowest is €1 each, that's what - €200 for 200 without stamps!! A pack of 100 blank cards was less than a tenner, bit of cross stitch and shape-cutting, bob's your uncle :) Thanks for reading Alex! I was so excited for my big day and took weeks to select everything. I wanted to make it special and perfect in every aspect. Fortunately, San Francisco venues helped a lot in making my day amazing and unforgettable. Wow the level of detail in this is amazing. This is fab Sharon! Really gorgeous! 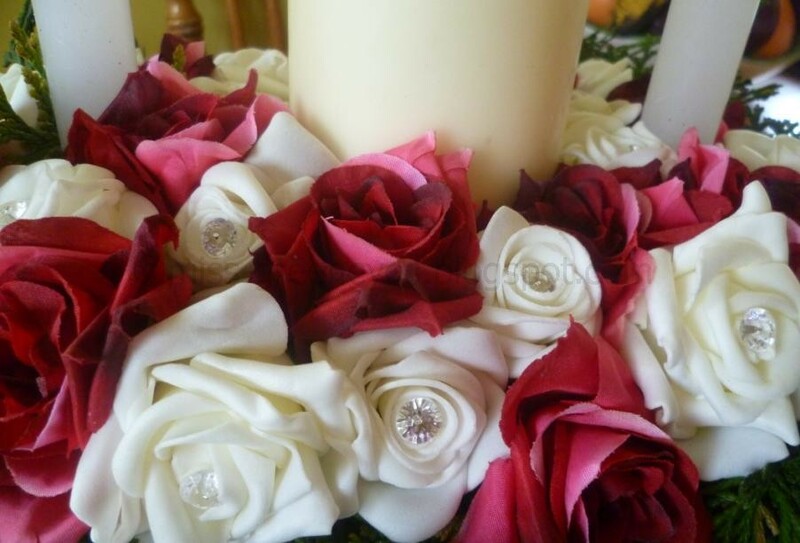 I made a few bits and pieces for our wedding a while back but never even thought of the flowers...mind you I was organising a wedding at home from here in London!